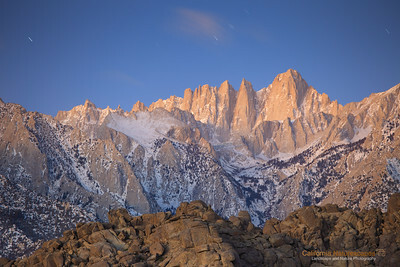 "Mt Whitney at Sunrise" Location: Alabama Hills, Lone Pine, California. Mt. Whitney is the highest point in lower 48 continental US at about 14,500 ft. The hike up to the top is one of the most rewarding things to do. I had a pleasure to do that a few years ago. We hiked up to 12000 ft the day before and camped overnight at a spot called Trailcamp. The next day I saw the fascinating orange glow on the peak at sunrise and since then wanted to photograph it. The opportunity came recently when I visited the town of Lone Pine and was able to photograph this magestic mountain at sunrise. This is a panorama image made from three horizontal shots and later stitched in photoshop. Tech Info: Lens: Canon EF 70-200 f/4L IS @ 200mm Camera: Canon EOS 5D Mk II Exposure: 1 sec each at f/13 and ISO 50 Filters: No filters. One has to really visit eastern sierra landscapes to truly appreciate its beauty. I don't think any photograph can do the justice of what it feels to hike on barren landscapes, camp besides some of the most scenic lakes and feel out of breath at high altitudes. Over the years I have had a few chances to hike on eastern sierra mountains including Mt. Whitney, but only recently I began to photograph it. So here are few images from one of the most unique places on the Sierra-Nevada mountain range. 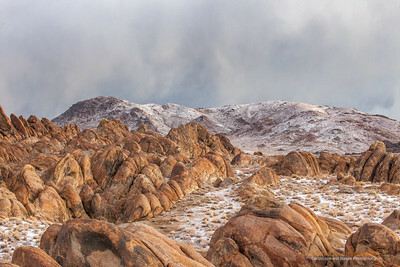 "Alabama Hills" Location: Lone Pine, California. 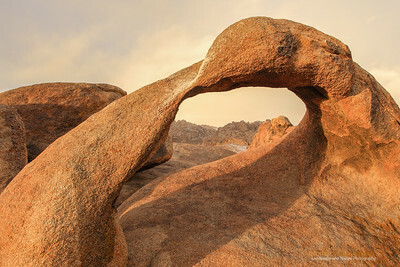 I always wanted to visit Alabama Hills to see its strange rock formations, natural arches and views of Mt. Whitney. This is an early morning shot showing strange landscape. It had snowed the previous night and was about to snow again. You can see streaks of snowfall on the distant hills while early morning light illuminated the scene from the side. I loved how this image turned out. Tech Info: Lens: Canon EF 70-200 f/4L IS @ 70mm Camera: Canon EOS 5D Mk II Exposure: 1/20sec at f/11 and ISO 3200 The light was changing fast and there was no time for me to setup the tripod, hence high ISO for hand-held shooting. Within few moments it was snowing in the whole area and the light that illuminated the rocks had gone. One has to really visit eastern sierra landscapes to truly appreciate its beauty. I don't think any photograph can do the justice of what it feels to hike on barren landscapes, camp besides some of the most scenic lakes and feel out of breath at high altitudes. 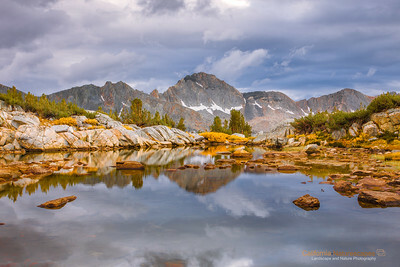 Over the years I have had a few chances to hike on eastern sierra mountains including Mt. Whitney, but only recently I began to photograph it. So here are few images from one of the most unique places on the Sierra-Nevada mountain range. 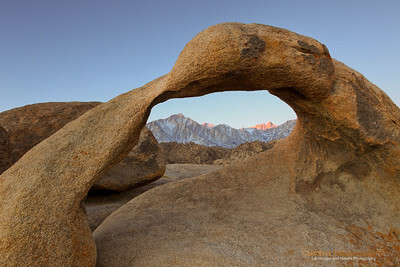 "Möbius Arch" Location: Alabama Hills, Lone Pine, California. Möbius arch is one of the most iconic rock formations on eastern sierra landscape, however, photographing it can get tricky. The name, as you may have guessed, derives from a mathematical concept of 'Möbius strip'. This is first of the series of few images of the arch where I liked the warmth of the morning light on the arch against winter fog in the background. On a clear day it is possible to see Mt. Whitney through the arch, which makes from another interesting image. Tech Info: Lens: Canon EF 17-40mm f/4L @ 22mm Camera: Canon EOS 5D Mk II Exposure: 1/8sec at f/14 and ISO 50 Filters: No filters. Note to first time visitors to the arch: It can can difficult to find the arch, but I found these directions quite useful in locating it. Since you have to be here much before sunrise it is advisable to first go and find the arch the previous evening. Also winter is the best time to go here since low angle of the sun casts beautiful shadow of the arch and the light is sublime. And oh yes, get enough warm clothing, it can get quite cold there. One has to really visit eastern sierra landscapes to truly appreciate its beauty. I don't think any photograph can do the justice of what it feels to hike on barren landscapes, camp besides some of the most scenic lakes and feel out of breath at high altitudes. Over the years I have had a few chances to hike on eastern sierra mountains including Mt. Whitney, but only recently I began to photograph it. So here are few images from one of the most unique places on the Sierra-Nevada mountain range. "First Light on Mt Whitney" Location: Alabama Hills, Lone Pine, California. On my second day of photoshoot at this location I saw this view of Mt. Whitney lit by the first rays of sunlight at dawn. My previous attempt at this location had Mt. Whitney shrouded in fog, so I was happy to finally get the view I came here to see. It is quite an experience to shoot here. You have to arrive when it is still dark and hike up to this spot to claim a spot on the rock behind the arch. I read on the internet that this place can get very crowded since it is a classical sunrise spot to photograph. I, however, had this place pretty much to myself. On the contrary I enjoyed company of another fellow photographer Keith Kapple who was also there to photograph the arch. We chatted a bit and later drove around hunting for other arches in the area. It is always nice to bump into fellow photographers in the field. There are few more interesting arches here but I will leave those for my next trip here. Tech Info: Lens: Canon EF 17-40mm f/4L @ 26mm Camera: Canon EOS 5D Mk II Exposure: 2sec at f/14 and ISO 50 Filters: No filters Post processing: The as-shot image needed warm tones since it was shot during dawn. Without adding warm tones the image can look excessively blue (cold color temp) One has to really visit eastern sierra landscapes to truly appreciate its beauty. I don't think any photograph can do the justice of what it feels to hike on barren landscapes, camp besides some of the most scenic lakes and feel out of breath at high altitudes. Over the years I have had a few chances to hike on eastern sierra mountains including Mt. Whitney, but only recently I began to photograph it. So here are few images from one of the most unique places on the Sierra-Nevada mountain range. Location: Alabama Hills, Lone Pine, California. Mt. Whitney is the highest point in lower 48 continental US at about 14,500 ft. The hike up to the top is one of the most rewarding things to do. I had a pleasure to do that a few years ago. We hiked up to 12000 ft the day before and camped overnight at a spot called Trailcamp. The next day I saw the fascinating orange glow on the peak at sunrise and since then wanted to photograph it. The opportunity came recently when I visited the town of Lone Pine and was able to photograph this magestic mountain at sunrise. This is a panorama image made from three horizontal shots and later stitched in photoshop. One has to really visit eastern sierra landscapes to truly appreciate its beauty. I don't think any photograph can do the justice of what it feels to hike on barren landscapes, camp besides some of the most scenic lakes and feel out of breath at high altitudes. 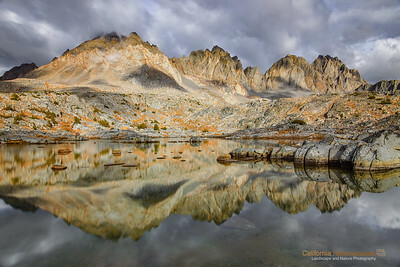 Over the years I have had a few chances to hike on eastern sierra mountains including Mt. Whitney, but only recently I began to photograph it. So here are few images from one of the most unique places on the Sierra-Nevada mountain range.